The Flevy PowerPoint Toolkit contains over 50+ slides worth of diagrams, shapes, charts, tables, and icons for you to use in your business presentations. 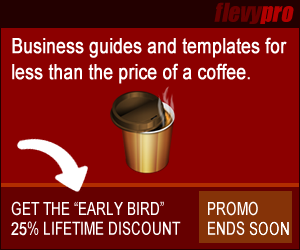 Flevy is the marketplace for premium business documents. Buy and sell PowerPoint templates, business frameworks, presentation templates, and more. Learn the methodologies, frameworks, and tricks used by Management Consultants to create executive presentations in the business world. Currently viewing the tag: "learn powerpoint"
I am excited to announce the 2nd version of Become a PowerPoint Guru was released this morning. What started as just a PowerPoint eBook, ‘Become a PowerPoint Guru’ has grown to be much more than that, since it now includes 2 very useful PowerPoint documents: the Business Slides Reference Pack and the eBook PowerPoint Toolkit. The book itself discusses the techniques developed and used by strategy consulting firms to create effective business presentations using PowerPoint. Many of the diagramming techniques have been highlighted in tutorials on this blog. But, beyond just diagramming, the book teaches storyboarding, i.e. the art of weaving a compelling story through the presentation. Topics here include Barbara Minto’s Pyramid Principle, MECE, and others; many, of which, are taught in top MBA programs, including the likes of Harvard and Stanford. The Business Slides Reference Pack (preview here) contains 60+ slides taken directly from executive presentations made by management consultants. The original audience range from execs of medium sized businesses up to Fortune 50 companies and cover a variety of different types of slide content, PowerPoint diagrams usages, and powerpointing techniques. You won’t be able to find any other download similar to this offered on any other site. The eBook PowerPoint Toolkit (preview here) is a comprehensive collection of ready to use, customizable PowerPoint templates. This was included in the original book, but with the 2nd edition’s release, this document has already been expanded to include additional PowerPoint diagrams. As this entry’s subject boldly proclaims, this is the only business presentation book you will ever need. The book’s content arms you with the knowledge and the accompanying PowerPoint decks arm you with additional tools to supplement that knowledge. Check it out @ http://learnppt.com.